I get bored. Either that or I have some form undiagnosed of decorating ADD. Every few months I feel the need to rearrange, redecorate, or renew a room in my house. And it doesn’t stop. Seriously, if I’m not rearranging furniture, I’m rearranging, or worse buying, new decor. Luckily, I have found a few ways to help remedy my disorder. First, I change decor and accent pieces depending on the seasons or holidays. This seems like a lot of work to some people. To me, it’s a necessity. I’ll give you an example. As June 1 rolled around, I was happy to put away what seemed like my old dreary spring decor; yellow flowers, yellow candles, chicks and birds. Now my living room is donned with patriotic happiness; I have an American flagged proudly draped around my large mantle mirror, a sign on my piano that reads, “Ice Cream for Sale,” and loads of candles with shells inside. In a mere 3 months, my fondness for this season will be gone and I’ll be thrilled to put away my summer things until June 1, 2012. Second, I can’t help it, but I love to rearrange my furniture. My husbands dreads the words, “I want to rearrange the living room.” I don’t understand his resent for wanting things to look a little different. I have just learned to move things on my own while he’s at work. That way, my feng shui is happy and he’s happy because I didn’t ask him to, once again, move the cables and cords to a different spot. Third, I purge. I am slowly, but surely, liking the idea of becoming a minimalist. Key word, slowly. I am far from it, but just getting a few things off my walls and counter tops makes things feel a little bit brighter. I held on to 2 mini candelabras for about the last 6 years. They were on my bathroom counter. I loved them. I thought they looked perfect. 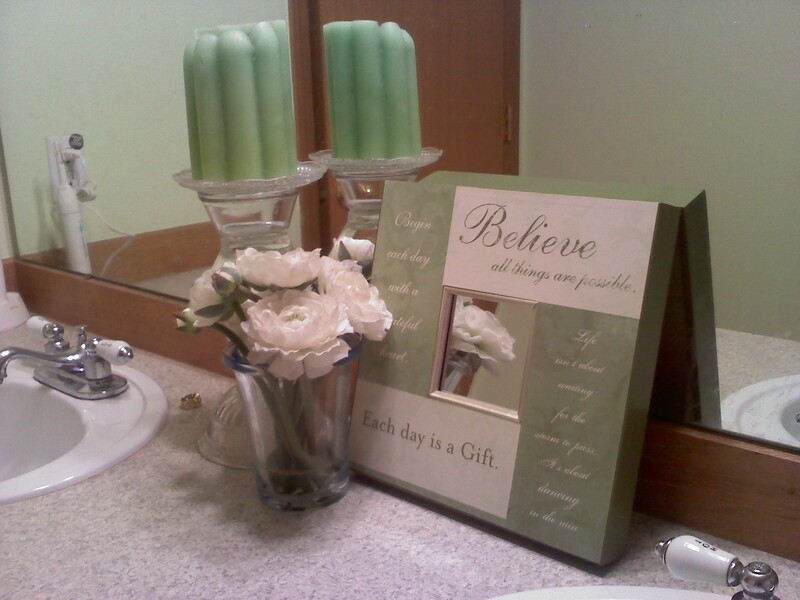 Nothing could look better on my bathroom counter top, even though they collected dust and I never lit the candles. They were going to stay. Until last week. I had the urge to purge. I was getting ready for bed when the thought happened. I looked around. I thought, “I can’t let go of these tarnished beauties.” But something came over me and before I knew it, they were in the goodwill bag. I grabbed a picture off my bedroom wall, found another candle that I had in storage and voila! My bathroom counter is perfection! OK, that might be a bit extreme, but just the idea of getting rid of something and trying out something new helps me feel better. So, what can you do to help a room in your house? Even something small like fresh flowers in a glass pitcher right in the middle of a cleaned off dining room table. Do something for yourself and for your family. For me? My sister just bought a house and asked me to help her decorate. Thank God I have an outlet, otherwise this could have been a long summer.